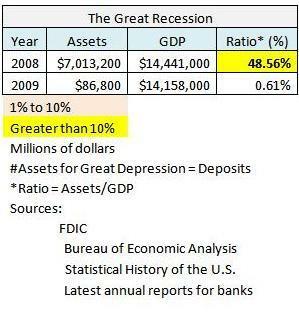 Even when adjusted for inflation and population growth, the 2008-09 banking crisis far exceeds previous banking crises, including even the Great Depression. There were 10,000 bank failures in the Great Depression, but few of them had branches. Today, a medium sized bank usually has hundreds of branches and the two big failures, Washington Mutual and Wachovia Bank had more than 8,000 branches between them. Thus, the number of actual bank locations affected in the current crisis, which is not over, is similar to the entire period of the Great Depression from 1929 to 1941. When it comes to the amount of money involved, the current crisis has 70 times the asset dollars in failed banks compared to the Great Depression. Even when the figures are adjusted for inflation and population growth, the current crisis is still much larger in dollar terms. How does this bank crisis compare historically? There is no comparison. The relationship of the current banking crisis to the size of the economy is more than seven times greater than the worst year of the Great Depression (1933). 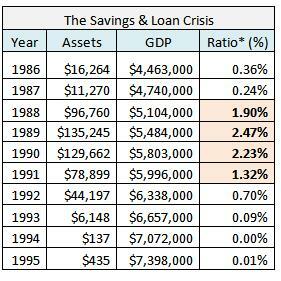 This crisis is 19 times larger with respect to GDP than the next worst year, 1989, in the S&L crisis. These are astounding relationships. We have been and still are in unchartered territory. 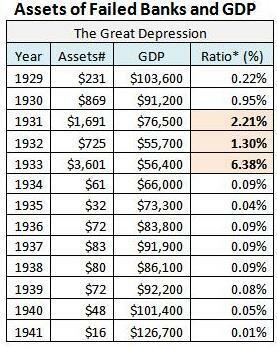 The Great Depression may not be repeated, but, in some ways, we have exceeded it to the downside. The ability of the U.S.and the world economy to withstand such a shock amazes me. Now we have to see how the aftershocks and the financial system structure weakened by the "big one" interact in the coming years. I did not say months; it will take years to repair the effects of an event of this seismic magnitude. Be prepared for the unexpected. We have never gone this way before. David DeGraw generating fees Valero Energy Corporation salaries Charles Biderman CEO of TrimTabs Apple smartphone New York Fed memo RZ Radar Logic Zhu Zhu "pets" mackerel People unsafe trucks rallies capitalism Web of Debt legal assistance The Elliott Wave Theorist crystalline solar cells Carl Levin lost decades reflation risk trades perspective inferences about God Daniel Ellsberg Kelo v. New London George W. Bush bear Christmas jobless corruptions producers DGP Mexican drug laundering schemes LFC COP auto production academic economists roche businesses Iran Clinton Office of the Comptroller of the Currency Can the Fed Stop Deflation?